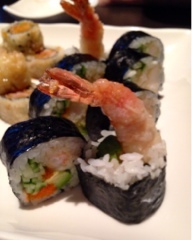 Sushi Moto is a spacious place, there’s large booths and tables in the centre perfect for bigger groups. Having been there before, my husband and I dropped by for more of the delicious sounding rolls they offered. Being a little adventurous we ordered the spicy killer maki ($9.95). Sure the name sounds deadly and makes you sweat in anticipation of the spice but it ended up being bearable. Essentially a spicy tuna roll with red chillies (although the menu notes jalapeño) and avocado which is then deep fried so there's a crispy crust and the tuna cooks. The crunch is nice and the heat augments the spiciness. Luckily, the avocado helps to neutralize it a bit so you can still enjoy the flavours. The spicy killer is filled with flavour but is meant to be shared as quite heavy. We also had our normal purchases the spicy salmon ($6.95) and dynamite ($9.95) maki. 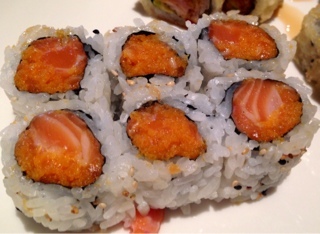 The spicy salmon is average with big chunks of salmon rolled with tempura bits and spicy mayo. Sushi Moto leaves the salmon in big pieces rather than chopped up into tiny bits, which I personally like. 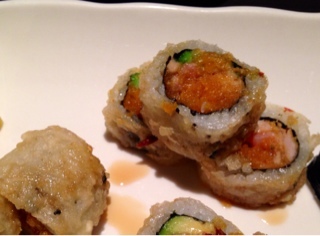 The dynamite is large and filling with tempura shrimp, avocado, julienned cucumber, and fish roe. Also a decent roll it could have been even better if the shrimp were freshly fried. 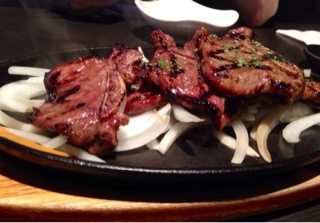 Craving something hot and meaty we also ordered the kalbi ($9.95). Arriving on a sizzling plate with plenty of onions it's fragrant and hot. The thicker cut and sufficient marinade was appreciated but for the price I did expect more than two pieces cut up into smaller pieces. 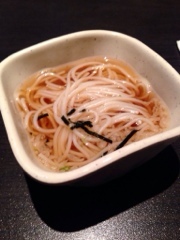 Additionally, Sushi Moto provides complementary Japanese noodle soup (not quite sure what the soup base would be). 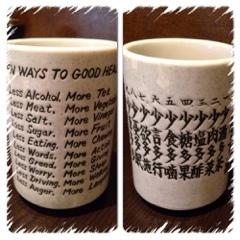 And if all the television screens can’t keep you entertained their tea cups offer an interesting read. 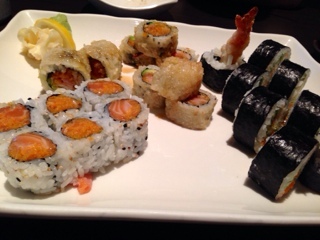 Compared to our first experience, Sushi Moto has improved slightly with their food’s flavours. Personally, I feel it’s worth it to pay a bit more for their "special" maki as they tend to have more fillings and often offers a different take on the normal rolls. Other ones that sound interesting include the erotica, tataki attack and the pink lady, which I’m sure we’ll go back one day to try.